The Flagstaff Ranger District has a policy during winter months that travel into the forest outside of the Arizona Snowbowl Ski Resort and adjacent to Forest Road 516 (Snowbowl Road) requires an access permit (commonly known as “backcountry permit”.) This permit is free and covers the entire winter season. As a courtesy to forest visitors FoNAF volunteers issue these permits on weekend mornings at the ski resort. The stated purpose of the program is “. . . to assist the Forest Service and the Coconino County Sheriff's Office with search and rescue should that become necessary.” However, the act of issuing an access permit offers an opportunity to increase forest visitor’s awareness of environmental hazards such as avalanches, winter weather, condition of trails, and the lack of safety patrols in the wilderness. Since some visitors arrive unprepared for winter conditions the interaction that occurs when applying for a permit may encourage them to make different choices. Included with the permit is an automobile tag that lists emergency contact information. Should the visitor’s vehicle remain in the ski area parking lot after closing this provides a mechanism to locate the visitor and initiate a rescue effort if indicated. 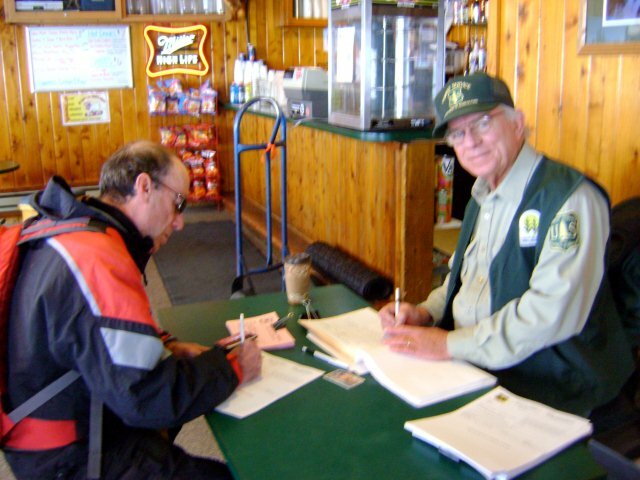 Two-person teams of FoNAF volunteers staff a table at Agassiz Lodge from 9am to 11:30am each weekend. In addition to issuing the permits, handouts are provided referencing avalanche safety and other useful information. Access to weather conditions and snowpack summaries are available and volunteers may offer suggestions for alternatives to the visitor’s plans if appropriate. To assist in this program requires only a willingness to engage forest visitors. Talking points are provided and all materials are available on-site. FoNAF provides on-the-job training and a vest that identifies the volunteer. An on-line sign-up is available so that team members can select a day or two each month. To contact the Backcountry Permit Coordinator for more information click here.